Excellent clean design that balances between high end toys and museum collectible. Everything in it's presentation is well done and presented in such a crisp way. Dinosaurs. The most widely loved and mysterious group of animals that kids of all ages gravitate to. From Jurassic Park, back to early Ray Harryhausen films, the names of these massive animals from T-Rex, to Triceratops, Apatosaurus to Velociraptor immediately bring visions to mind of a time long ago, where true giants ruled the world. Aside from modern day birds and cgi creations, all we have left to admire most of these long gone masters of the earth, are fossils. 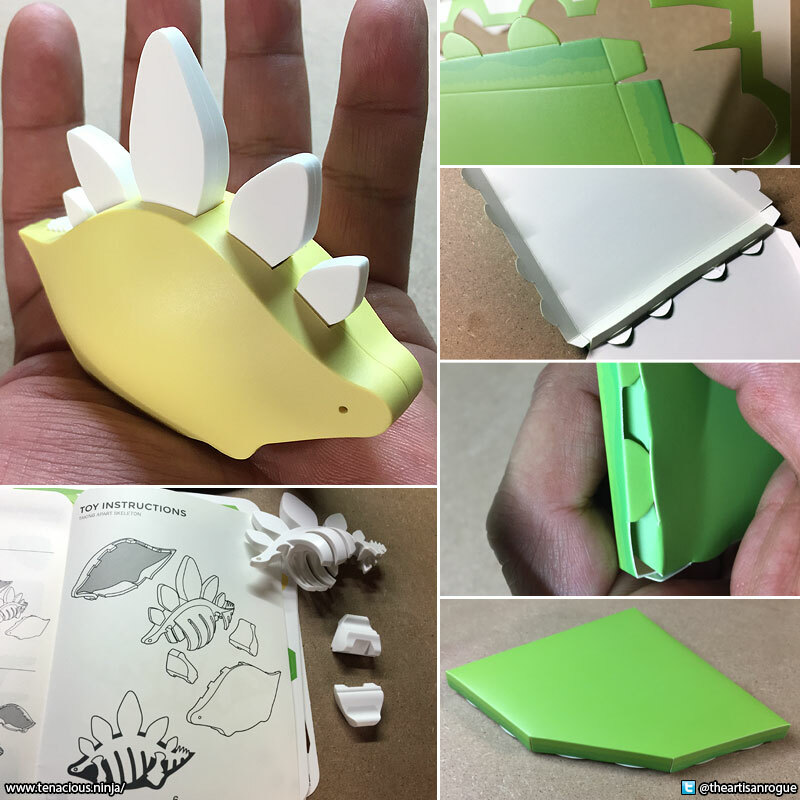 And today, I'm going to tell you a bit about HalfToys' cool little "Stego" toy, which surprised me in a few ways. Stego is insanely cool in design, and breaks apart easily, but held together very well with internal magnets. (Right Column) Papercraft is the majority of the toy assembly. I had checked out HalfToys' site and really like the ideology behind this line, as well as the expansive line of dinos they had available, in that it is more of an edutainment driven concept. I was interested to see what the draw would be for the 3+ age group that these are marketed towards. Everything about this playset, is premium. 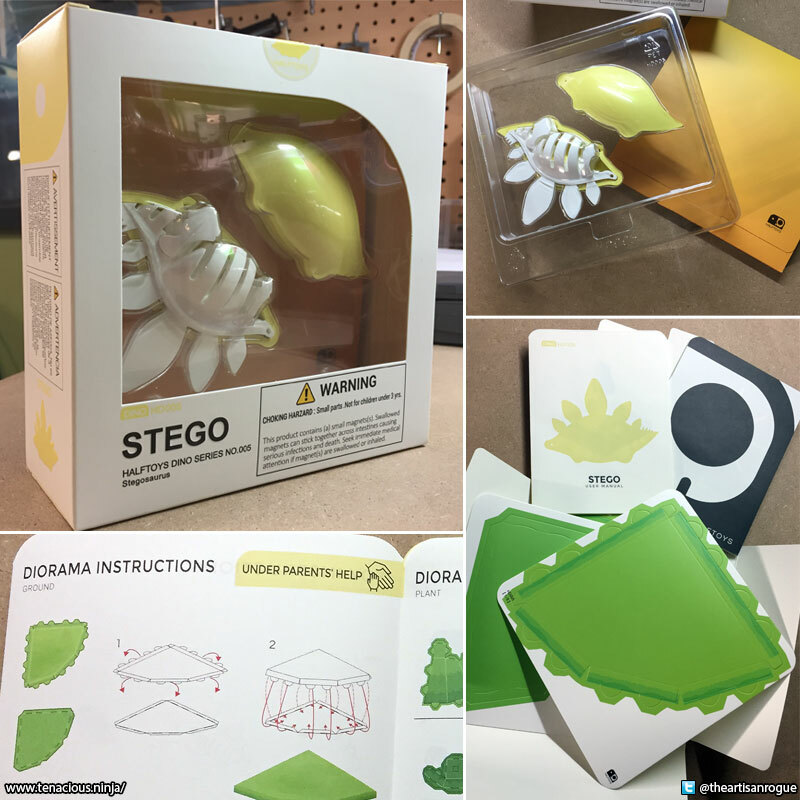 The Stego figurine itself is smooth rounded edges and very modern, almost urban, in it's aesthetic. There is a beautiful simplicity of it that easily makes the Stego a welcome display toy on it's own on any office desk, or toy collection shelf. The rest of the playset is made up of a cardstock printed set of die-cut cards, leaning towards a papercraft element. As noted in the instructions, this part is very much driven to be for "get help by an adult". Now, I am a huge fan of both the general form of papercraft kits, as well as Origami, and work with die cuts and folds at my day job. HalfToys certainly has a good thing going here, but it's very much a time intensive action for even someone who is fairly practiced in working in paper builds like me. There are a few tricky areas that were to be found (see the circled element below, caused by some stress points from overlapping tabs and folds). This was probably something that many parents might feel frustrating, not unlike what many have often complained to Nintendo about with the recent LABO cardboard sets of peripherals that have hit the market in recent months. If the folds and kits are too complex, the attention span of kids (which is about as long as a Vine video), then most kids wander off to other things. The papercraft engineering is absolutely stunning and well developed to match the Stego design. 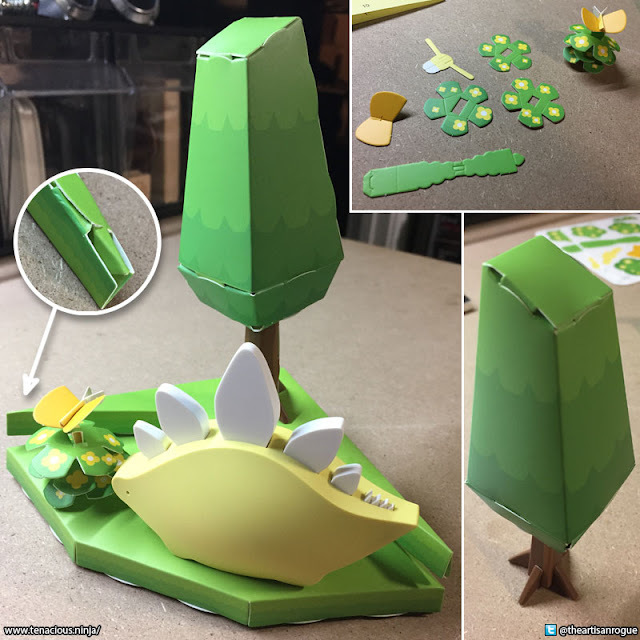 I think that if the papercraft had been instead made from an acid-free polypropylene (like what Ultra Pro deck boxes for cards are made of), there would be a more reliable factor of error and durability that would probably have allowed me to let one of my very young nephews to have tried assembling it. Make no mistake, the cardstock that the playset is printed on is great. Bright colors, clean die cuts, and it's about 14pt. in thickness, but to adhere to a 3+ age group, something more durable would probably be more of investment by parents who will leave kids alone with these. Stego himself is fairly sturdy, but for the younger set, should still be played with while supervised, as the skeleton does have some removable parts, and the rib cage area does have a bit of fragility to it. Halftoys has these sets selling for right around $18 each, which is not a bad price for what you get, and they do have a great Black Friday sale going on now. So, my final thoughts on this set. I really like it. But I also really like the papercraft aspect, and am a fan of the designs of the dinos. For the average kid, the imagination fuel is there, and more compelling sets are announced via their blog with modern day and fantasy animals (the red Dragon looks stunning! ), people, and more varied environments in the pipeline. I will be interested to see how this line evolves. Essentially, it's great fun for everyone, I had a blast putting it all together, and love the look. Kids will no doubt get a kick out of these dino designs as well, but remember that this is more advanced set up, with simpler play output.